Listen to an mp3 of Lenny. JOE PUBLIC – IN THEIR OWN WORDS…. 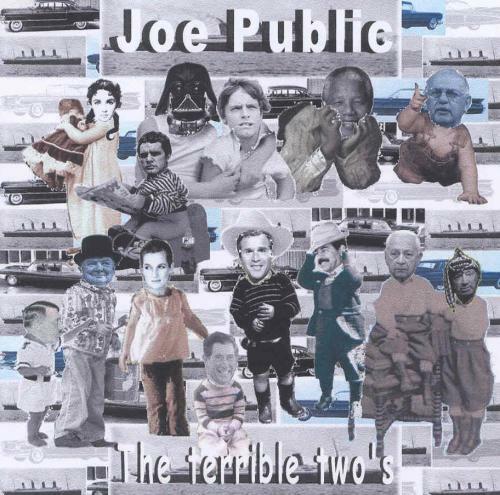 Joe Public, as the name suggests, are very much a you-and-me assembly of musicians and, like the public at large, they can be in your face, or in your head or, if you’re desperately, unlucky even in your bed. Rock music like rising damp has a cathartic ability to creep up on one, and Joe Public accept no blame for this, for all they are doing is what comes natural. The ‘Public can be as natural as Earl Grey in the morning, or a Jehovah’s Witness on your doorstep … that little part of you that is called patience is all that’s required. Patience to listen to ‘The Terrible Two’s’, their first musical offering. All the titles on the CD are self-penned apart from ‘Day Tripper’, written by a little known Liverpool pair. As befalls most musicians the prospect of entering a professional studio and admiring the omnipresent ‘clock on the wall’ was not particularly appealing, so what better way then to take the recording budget and build a studio of one’s own, which is what ‘The Pit of Despair’ in Paarl, creative capital of the Boland, is all about. So who are these men and what do they do? Aeron Brown – song writer and guitar man whose influences range from ZZ Top to the radio in his carpentry workshop. Pieter Heyns – drummer man who listens to everyone but takes no nonsense from them, also known to earn a living in something related to Tobacco Road, but for that he was given a suit. Ryan de Freitas – the voice man, a relative spring chicken in the company of these seasoned muzo’s. He’s doing the typical everything that singers do on the sidelines. He moonlights in hotels and taverns and sometimes plays the lotto. Geoff Ross – the keyboard man born into a family of extensive business interests, his business is listening to the weather report while tending to his furniture empire just off the Kalk Bay railway line. For his sins he was not given a suit. Also featured on the CD are The Alien – sound engineer with nimble fingers and diverse experience who has worked with the likes of Steve Hofmeyr, Mauritz Lotz and Jethro Butow. The self same Butow whose musical pedigree is legendary, guests on the track ‘Death Row’. The bass guitar was passed around, but none of the principals wanted it, so it fell into the very capable hands of Pieter Human and Gareth Sherwood. The harp solo on ‘So Lonely’ was blown with Dylanesque conviction by a public man named Derek Harper jnr and Maurice Clyde aka ‘Fingers’ put in his two cents worth on the selfsame boogie. So start the fire, switch off the TV, leave the washing up for Monday morning, the Joe Public are here. They’re you and I and now they’re in your kitchen sink. ‘Closing Up’ – a sombre Wild West gothic flirtation between a smoking gun and a distortion pedal. ‘Day Tripper’ – even Jimi Hendrix could not resist that dung-dung-dung lick, who are the Public to? ‘Lenny’ – We’ll never forget OJ will we? As innocent as a cockroach on a Greek salad. ‘Tanic Twist’ – Sorry Leonardo, this is not to honour your drowning scene. ‘Chance Of A Lifetime’ – OK, so it could be, the Public like it. ‘So Lonely’ – the smokey bar again, but no work the next day. ‘Death Row’ – the Mayan civilization predicted the end of ours in 2012 – it’s getting a little to close for comfort. ‘King Of Swing – Benny Goodman’s back in town, so are the Public. ‘Live For Me Only’ – keep this space open. A few things happen to those less young rockers among us, like Joe Public. Firstly they call their album 'The Terrible Two's', which as any parent knows, is neither a reference to the rhythm section nor that difficult second album. Then they take an old, classic Beatles song and give it a severe hard rock pounding with some appropriately mixed-in movie sound snippets, leaving it sounding like the angry howl of a world about to have a war thrust upon it by the "StrawBlairy Bush" Gang. Which is what they do with poor old 'Day Tripper'. So Cape Town's Joe Public have gone public with a big opening roar. Those vocals you'll hear are those of Ryan de Freitas (vocals, guitars), alongside Aeron Brown (imagine Ernie Els with Evan Dando's hair) on guitar (and he wrote all these songs), Pieter Heyns on drums and Geoff Ross on keyboards. Joe Public was formed by Aeron Brown and Pieter Heyns, who decided to focus on recording and playing the original material written mostly by Brown over the past decade. 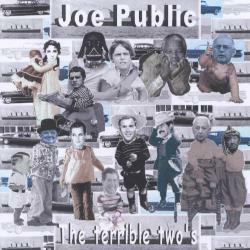 Originally a three-piece band, the two remaining members of Joe Public began recording at the beginning of 2002, with 'The Alien' assisting with the initial production. Brown and Heyns were later joined by Ryan de Freitas and Geoff Ross. Apart from the four principle members, other musicians that feature on the CD are Pieter Human and Gareth Sherwood (bass guitar), Mick Clyde (slide guitar), Derek Harper Jnr (harmonica), Alli Heyns (guitar) and legendary SA axeman Jethro Butow (lead guitar on 'Death Row'). The band describe themselves as a traditional rock band, but the feel and intensity of the tracks on the CD varies considerably. The album contains nine original tracks alongside that Beatles cover. 'The Terrible Two's' takes the listener on a rollercoaster ride from the grinding guitars of the opening track, 'Closing Up' and 'Day Tripper', to the acoustic guitars of 'Black 'n Blues' and 'Tanic Twist', and the fusion rock oriented 'King Of Swing'. This is reflective of the band members' varying musical influences, which include ZZ Top, Deep Purple, Nickelback, Weather Report, B.B. King and Jamiroquai. The album was recorded at The Pit of Despair in Paarl, and 'The Alien' mixed and mastered the CD at the Pakistani Boarding House in Johannesburg. Joe Public are currently rehearsing for upcoming performances in and around Cape Town and a tour of the Garden Route and Johannesburg are in the planning stages.